SnicketySlice is a YouTube channel dedicated to reviewing Japanese games and media. The videos include voiceover from myself (Snickety) and with the occasional appearance of the channel's mascot - a video game librarian by the name of Sachiko. Her role is often to act as a foil to Snickety and parody a lot of visual novel/anime tropes. This is a good role for voice actors wanting to let loose on something fun and silly. The character has previously been illustrated and voiced. You can see an example at the link below. However, it is not necessary to try and mimic the original VA. This is a recurring role for a monthly series so it's necessary you have some sort of social media (Twitter, Discord, etc) where we can chat and discuss the script. This is a non-paid role (sadly) but a credit and links of your choice will be placed in the video descriptions. Please make sure you have a high quality microphone and the ability to record without intrusive background noise. Thank you for taking an interest in the role! 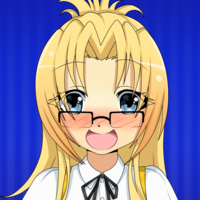 Sachiko is a shy, bumbling game librarian that is extremely optimistic about her job, despite her boss being a slave driver that seemingly has no regard for her well-being. The character is both a parody and sincere send up of many cute anime girl tropes. I was carrying a huge stack of games and I think one feel off the top. I'm sorry! Please don't dock my pay! I promise I'll try harder next time. I need to focus more. I get easily distracted by all these cool games on the shelf. Sometimes I get so distracted I just have to play them and I forget about work. Err, please forget about that last part!